Dean Bubley is an experienced and well-connected technology industry analyst and consultant, with a track record of accurate predictions, timely advice and outspoken opinions. He speaks at around 30 events a year. Best known as the founder of Disruptive Analysis and @disruptivedean on Twitter, he has over 20 years experience tracking innovation and company strategies in the mobile, telecoms & IT fields. 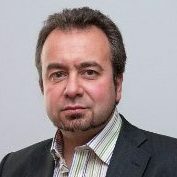 He also covers regulatory and policy-making issues, and advises on the broader societal impacts of technology evolution. He is one of the leading analysts covering Mobile Networks, Internet/Broadband Infrastructure, The Future of Voice and WebRTC. Beyond that, he is also engaged with other areas of telecoms, IT/cloud, semiconductors, entertainment & media, smart cities and the emerging Internet of Things. Known as a contrarian, often with challenging opinions that go against industry consensus, he has a diverse network of contacts and clients, and is able to facilitate introductions, assist business development, and offer strategic advice to startups, established companies, and representatives of finance & government bodies . Mr Bubley was formerly an equity analyst, covering communications stocks with Granville Baird, the UK arm of US-based investment bank Robert W. Baird from 2000-2002. Prior to that, he spent eight years at UK research firm Datamonitor from 1991-2000, where he co-founded the company’s Technology business, managed the Internet & Networking area and custom consulting operations, with roles of Chief Analyst & Director of Consulting. He holds a BA in Physics from Keble College, Oxford University.